"Canción en la noche" forma parte de las películas que se proyectan en The Unseen Movies Festival, que se celebra del 20 al 23 de diciembre de 2017 en Atenas, Grecia. The “The Unseen Movies Festival” is a film festival by the Pugnant Film Series group, keeping loyal to the principles of DIY. 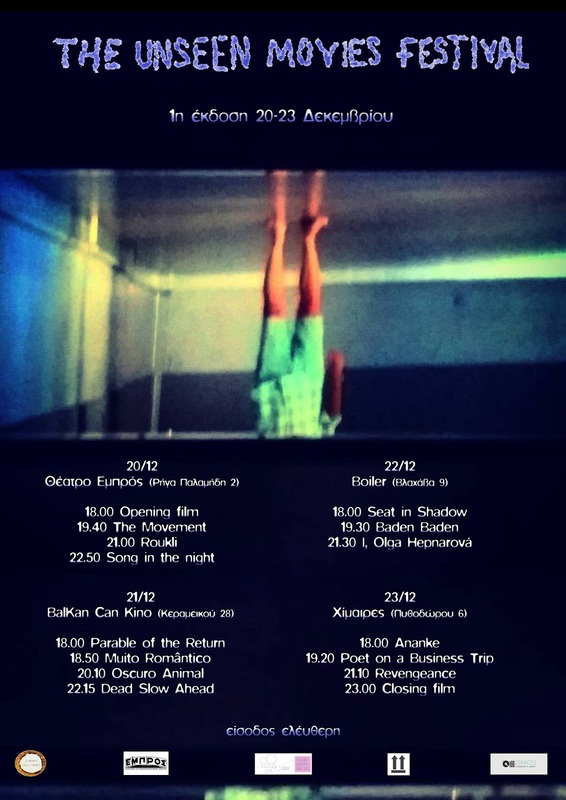 A selection of recent film productions (2015-2016), which were selected from thousands of films, never having made it to the Athenian cinemas, will be screened. The film line-up includes films varying in style, subject and aesthetic. The schedule includes films, which have been acknowledged in international festivals and others with limited impact or distribution. In a general basis, we selected the films of our program according to our preference in the “handmade” cinema. In the “The Unseen Movies Festival” you will find films from around the world. “Unseen” films, as they do not succumb to the commercial requirements of a screening room or to those of an extroverted PR-dominated art network, in their majority. Films, which primarily portray the innate need for expression. A film comes into existence at the point when it is screened and thus becomes visible. The point of its screening, might be the only point in time when it has fulfilled it cinematographic opus. We will be showing important films, which have never before been exposed to an Athenian audience. Moreover, in Pugnant Film Series, we feel we owe simple human gratitude to all the artists and producers who responded to our call for them to share their films, making this festival possible. We also owe gratitude to all the people behind the venues (Embros Free self-Theater, Balkan Can Kino, Boiler and Chimeres), which will host this festival.